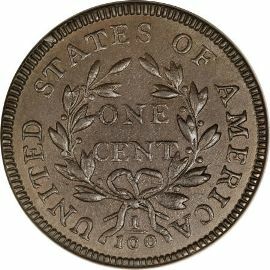 Draped Bust Large Cents were made between 1796 and 1807 despite major problems! Major problems at the mint! Draped Bust Large Cents were made between 1796 and 1807 despite many difficulties at the mint. Some of the problems the US Mint encountered in making large cents include: machinery that was inadequate, inexperienced employees, lack of capital, and sickness. The mint also had difficulty getting enough copper to make the coins it needed. Domestic supplies of copper were impure and generally of bad quality. Most all copper blanks were imported from the Boulton & Watt Company in England. shows a portrait of Liberty designed by Robert Scot and inspired by a drawing sketched by Gilbert Stuart. 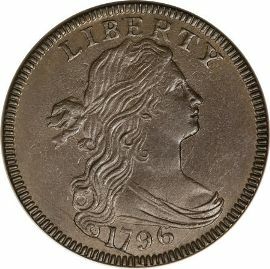 Liberty has flowing locks of hair with a ribbon in it, along with the inscription "LIBERTY" above and the date below. The reverse has a wreath made of olive branches held together with a bow at the bottom. Within the wreath is the denomination "ONE CENT" and encircling the design reads "UNITED STATES OF AMERICA" with the fraction 1/100.